SAL DeTRAGLIA'S VIRTUAL TAPAS BAR: SEND IN THE CLOWNS. This astounded me. Here is a nation that—having suffered severe famines over the past several years—can’t even feed its own population. 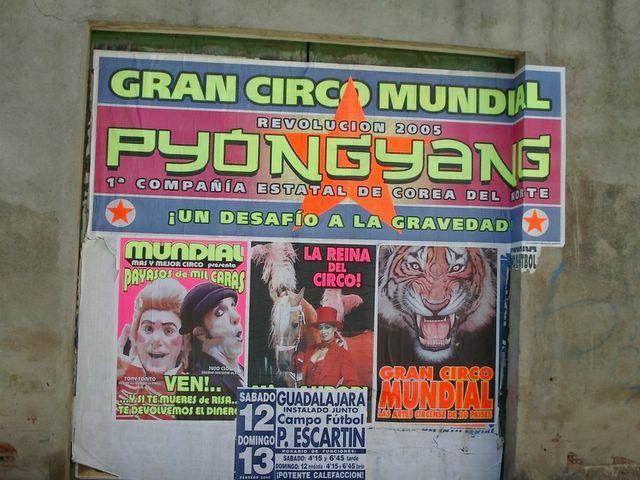 Yet it sponsors a circus troupe that is touring Spain and, presumably, the rest of Europe. Sadly, I was not able to attend this curious extravaganza—a missed opportunity that will undoubtedly haunt me until my next glass of wine. I did, however, try to imagine what might take place during a REVOLUTION 2005 performance. Surely, REVOLUTION 2005 would have few (or no) animal acts. Any animals roaming around North Korea would have been eaten by a desperate population years ago. Nor would it feature any short-stature clowns sporting curly wigs and Elton John-esque glasses. 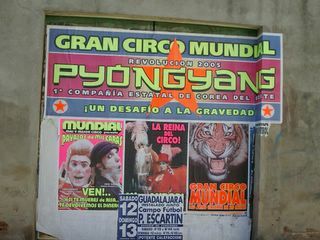 Boy-oh-boy!—that would be a very sad group of clowns once they see the “welcoming party” awaiting them upon their return to Pyongyang airport. Perhaps REVOLUTION 2005 has a trapeze act. The acrobats would be wearing missile-shaped helmets and shouting, “Hey, Japan! Check us out! Check us out!” as they soar through the air with the greatest of ease. Then there’s the “DESAFÍO A LA GRAVEDAD!” teaser that’s so boldly touted on the REVOLUTION 2005 sign. This translates to “A challenge to gravity!” Now, this sounds like an interesting act, but I have doubts. If North Korea had, in fact, developed some kind of anti-gravity technology, then the majority of its population would’ve surely floated over to Seoul or Tokyo by now. A twenty-inch tall, miniature, Soviet-era tank rolls onto center stage. The top door opens, and out pops seven giggling clowns dressed in purple Mao jackets and enormous orange shoes. They bounce around the stage, doing somersaults and squirting mustard gas from their plastic lapel flowers. And toe plumped with gout. And finally—for the show’s big finale—the entire audience is herded at gunpoint into a sea-freight container and shipped to Pyongyang port for 20-25 years of signing affidavits and giving shortwave radio interviews. The smarts ones bring along their popcorn and Milk-Duds®. Is not "Team America" included in the show? AH-HA! So that explains the "Challenge to Gravity." All of the circus performers are puppets; and thus, suspended in mid-air by strings. Hey...worked for Sandy Duncan in the broadway version of Peter Pan. Worked for David Lee Roth in the "Jump" video, also. Thanks for cracking the case...Anonymous. This post made me laugh out loud, really good. About the rodizio -- alas, it can be found pretty much in any major, and, for that matter, minor, Brazilian city, thus not qualifying, unfortunately, for that particular list. However, rodizio restaurants in Sao Paulo are better than anywhere else in the country except maybe (just maybe) Porto Alegre, in the south heh. Greetings and salutations to all Americans in Espana. Muito obrigado, Bel! It's good to know that someone (other than me) appreciates my humor...or attempts at humor. Regarding a far more important topic, I've eaten Rodizio once. Not in Brazil, but in Texas. It was a restaurant in Dallas, Texas called "Fogo de Chão." It was really cool! Waiters went from table to table carrying huge skewers of vertically-roasted beef, pork and chicken. You'd call a waiter over, tell him your preference (e.g., "beef, medium rare") and he would slice it onto your plate. It was an all-you-can-eat arrangement. Very memorable. There are Rodizio restaurants throughout Spain (including Barcelona and Madrid). I must go to one...soon. You know your rodizio - bravo! Yes, that's exactly as you described it, and now, in Sao Paulo rodizio restaurants there's a new(ish) method of letting the waiter know whether you still want to eat: there's small piece of wooden stick reminiscent of a chess piece - on one side a red sign, on the other green. your cocomania is hysterical, reminds me of my own long grown tree old loner in the yard, misfit among the looming bougainvillae and shrubbery... and the nuts make my summer. the sound of it the taste of it the fountains gushing out of its sweet milking hardness. Yum. err that was meant for the other posts.... coconuts, politics, same thing u either love them or hate em.